In almost every home there is valuable property that may be of interest to thieves. First of all, we are talking about cash, jewelry, some important documents, family heirlooms. To ensure their safety will help safe. If you are already ready to purchase a durable and reliable metal cabinet to conceal your valuables, then it’s time to think about its design and installation site. Today we will talk about how to choose a safe for the house. This question is not idle. Paying him enough attention, you may eventually buy a safe that does not bring you peace of mind and confidence in the future, because it will not be able to become a serious obstacle to the attacker. What dangers can be put to the values ​​stored in your home? First, they can simply be kidnapped. Secondly, they may die in a fire, from which none of us, alas, is immune. (Of course, floods, earthquakes, tornadoes, tsunamis, etc. can be added to this list, but the likelihood of all these emergencies is incomparably lower.) 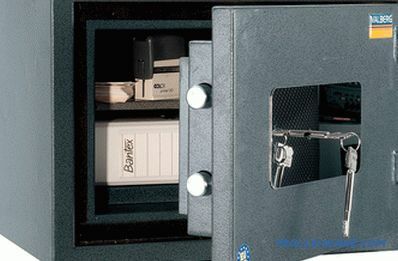 Safes can protect your documents, money, jewelry from both. But ... you have to choose what you should fear more, because most of the safes are not capable of equally reliable protection from both fire and burglary. The fireproof safe will not stop the professional bearer, and burglar-proof will not save from fire. According to statistics, in the overwhelming majority of cases the danger to the valuables stored in the house comes from fire, and not from intruders who illegally enter your home. However, fireproof safes are still less likely than burglar-resistant - as a rule, only when it comes to storing some personal documents, photographs, family relics that are very expensive for you, but not of special value to thieves. . The fire-resistant safe is designed for the long-term protection of things stored in it from the effects of temperatures of several hundred degrees. This is achieved by filling the space between the inner and outer walls of the safe with refractory foam concrete, which has a finely porous structure and, as a result, low thermal conductivity. To ensure the fire-resistant properties of the door use the so-called thermal lock and / or insulating pads, expanding when heated. The average fire-resistant safe protects its contents from fire for 30-60 minutes. This, as a rule, is enough to force the firefighters to extinguish the flames. Some more expensive models are able to resist heat for 120, and sometimes even 240 minutes. In general, all safes, according to their fire resistance, are divided into 6 classes. The criteria on the basis of which the metal box belongs to a particular class, are the time of permissible heat exposure and the maximum temperature inside the safe when the external temperature rises to 1100 ° C.
The maximum temperature inside the safe during a fire determines the type of storage facilities. For example, safes that maintain the temperature up to 170 ° C are designed for storing paper documents, and so-called data-safes, ensuring that the temperature inside does not rise above 50 ° C, can store magnetic storage media (flash devices, CDs and DVDs, etc.). Do not forget that fire-resistant safes protect only from the flame and are not able to stop the burglar. They are not even attached to the wall or floor, as they are burglar-proof, as this may adversely affect the ability to withstand elevated temperature. From this it follows that such safes should be hidden as far as possible from prying eyes. 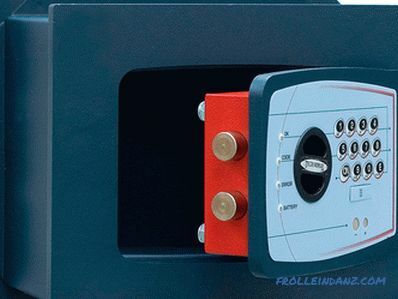 The main characteristic of burglar-proof safes is their resistance to burglary, established on the basis of test results. 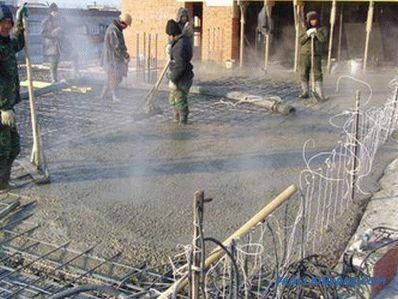 Heavy high-strength concrete, which is filled with space between the outer and inner walls of the safe, can guarantee good burglar resistance (sometimes concrete is additionally reinforced with metal, granite chips or corundum). It is thanks to this "stuffing" burglar-proof safes turn out to be significantly heavier than fire-resistant safes. 1. Safes of class H0 are relatively simple metal boxes with a wall thickness of up to 5 mm, they are designed to protect more from unclean guests or employees than from burglars. 2. 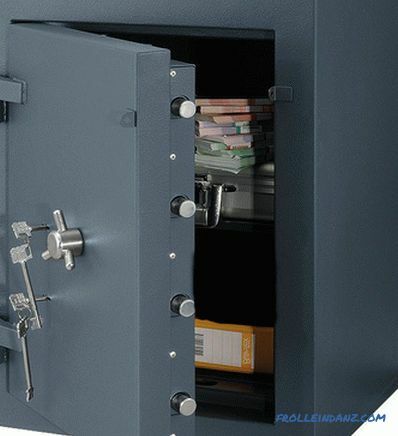 Class I-II safes are usually used for storage at home of documents, relatively small amounts of money and weapons. 3. Class III safes protection is acquired by those who are going to keep large amounts of money at home and especially expensive jewelry. 4. 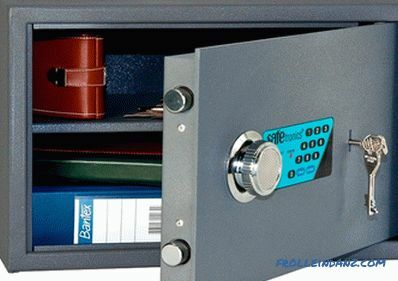 Safes corresponding to classes IV-VII of burglary resistance are classified as professional, they are designed to ensure the safety of money, jewelry and documentation in bank premises, while individuals are practically not used. 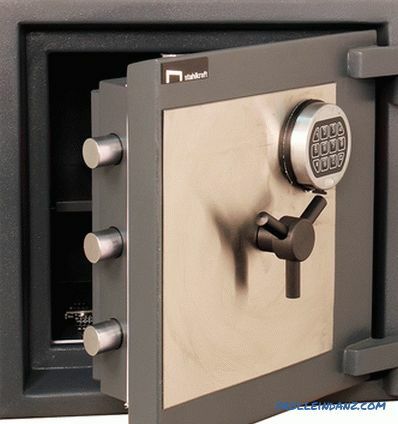 Of course, if we are talking about a burglar-proof safe, you should not forget about the need to equip it with a high-quality lock, otherwise the super strong walls and the door will be worthless. We also note that the best way to ensure the safety of your valuables involves an integrated approach: it is not enough just to equip a reliable storage facility, you also need to connect the house to the security monitoring system. After 10-15 minutes after the sensors are triggered, a police squad will arrive at the scene, which reduces to zero the chances of criminals to profit. If an intruder who has entered your home has enough time, he will be able to cope with any, even the most reliable safe, with the right skills. A little higher we stated that all safes have their own narrow specialization. But from each rule, as you know, there are exceptions. In this case, the exception is the category of universal safes capable of performing both functions. Fire and flame resistant models that will help preserve the above property and in a robbery, and in the event of a fire, are rare and are quite expensive. In addition, they, as a rule, provide the minimum permissible level of protection, corresponding to the lower classes both in fire and burglary resistance. 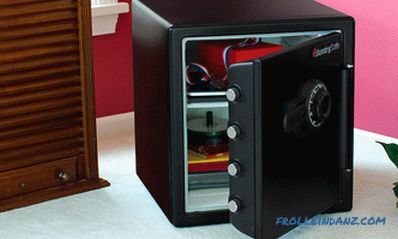 A variety of fire-resistant safe safes are models made on the principle of “two in one”: a burglar-proof storage is located inside a fire-resistant box. Such safes cope with the performance of both tasks better, but not everyone can afford them. 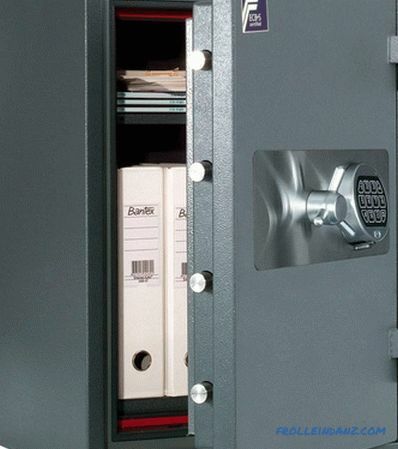 The burglary resistance of a safe is not primarily determined by the thickness of its “armor”, but by the reliability of the lock installed on it. Today, safes are equipped with three types of locks: key, code (which, in turn, can be mechanical or electronic) and biometric. It should not be thought that in this age of digital technology, key locks are preparing to leave for a well-deserved rest. No, they are still used more often than any other. 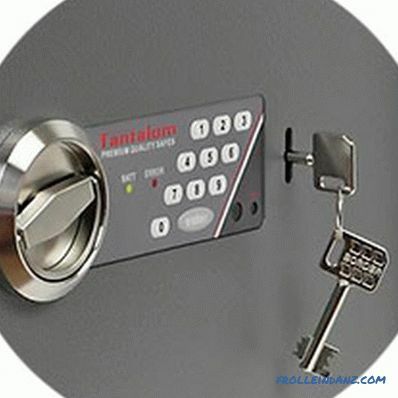 Cylindrical locks are installed on safes extremely rarely - preference is given to lever-type locks, more resistant to the use of master keys and forceful hacking. 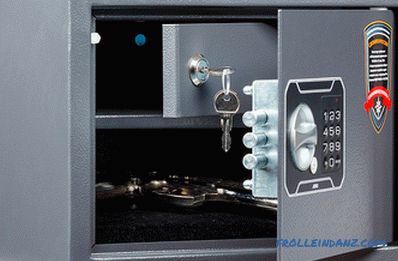 To increase the reliability of safes, they sometimes have two locks installed, the keys of which are strongly recommended to be hidden in different places. An additional element of protection can be an electronic chip placed on the key itself. The locking device, without recognizing the chip, will block. Such a system allows you to protect against the use of duplicate keys made from the impression. 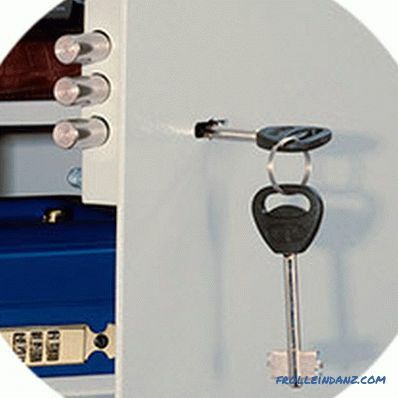 Code combination locks, often referred to as limb locks, are strongly associated in the minds of most of us with safes. Such constipation involves the introduction of a code combination of numbers, for which there is a rotating knob on the outside of the door with a scale from 0 to 99. Trying to guess the code by simply iterating is meaningless - taking into account the number of possible combinations, it will take months or even years. The reliability of a code lock depends largely on the ability of the owner to keep the code secret. Electronic combination locks have a number of significant advantages over mechanical ones. Electronics is more flexible in operation. 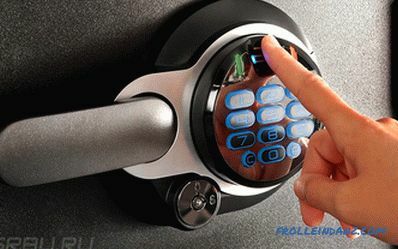 Such a lock can be programmed to the mode that best suits your security requirements. 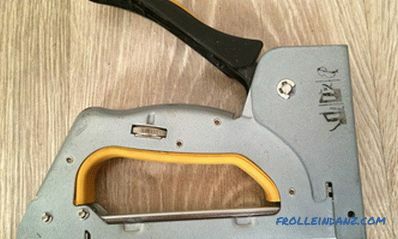 If desired or necessary, you can easily change the code (in the case of many mechanical combination locks, this operation is impossible in principle). In addition, the electronic mechanism has a function of protection against the selection of a combination. However, it should be borne in mind that electronics often malfunction than mechanics, in the case of safes this can be fraught with trouble. 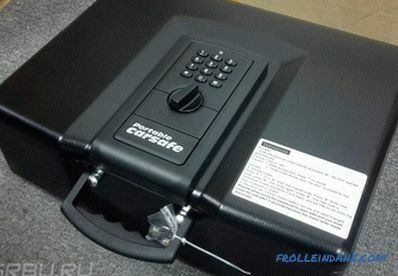 The biometric device identifies the owner of the safe according to some unique individual parameters. These can be, for example, fingerprints or a type of retina. Such safe locks are much more expensive than classic ones. Before you choose a home safe with a biometric lock, think, and not whether the cost of storage exceeds the cost of its contents. It hardly makes sense to pursue this trend of safe fashion, because traditional constipation copes with the task no worse. When choosing one or another type of locking system, you should be guided by the frequency of using the safe. If it is assumed that you will open and close your vault often enough, we advise you to give preference to the key lock: it is more convenient, and it will last longer. 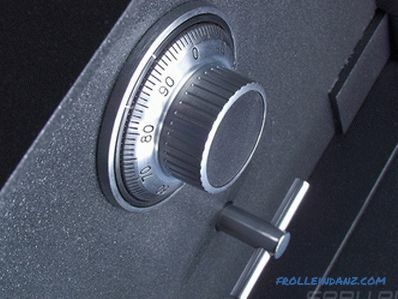 If you use the safe is not too active, you should choose a combination lock. The best possible option is a safe, equipped with two different types of locks, for example, key and code. 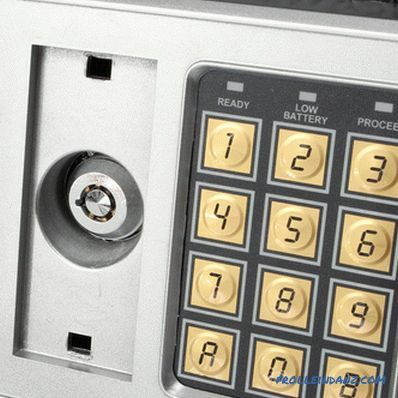 We recommend choosing uncommon models of safes, since many hackers have master keys for specific types of popular locks installed on mass-produced products. There is no safe that could not be opened. The success of an enterprise depends on the quality of the repository itself, the level of qualifications of the burglar and the time that he will be assigned to work. 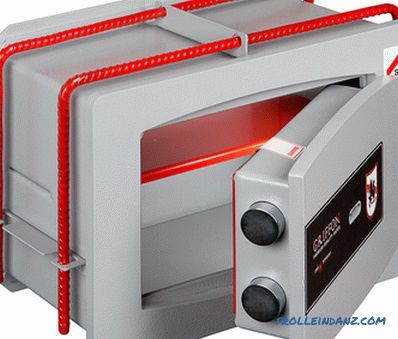 Reliably hiding the safe from prying eyes, you thereby increase the time required to commit theft, which means that the probability will increase that the thief will abandon his undertaking or will be caught at the crime scene by a police squad who arrived at a signal. 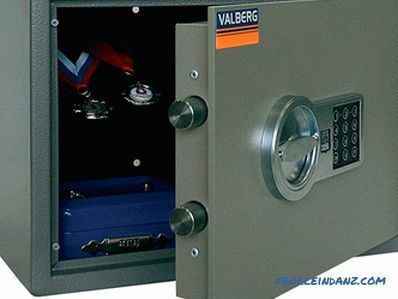 By the method of placement all safes are divided into several types. 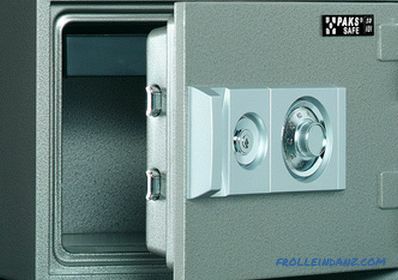 Embedded safes are the most ideal from the point of view of the time needed to search for them. They are easy to disguise with furniture, interior elements, decorative panels used in the decoration of the room. In addition, the wall at the expense of its mass significantly increases the burglary and fire resistance of the store. 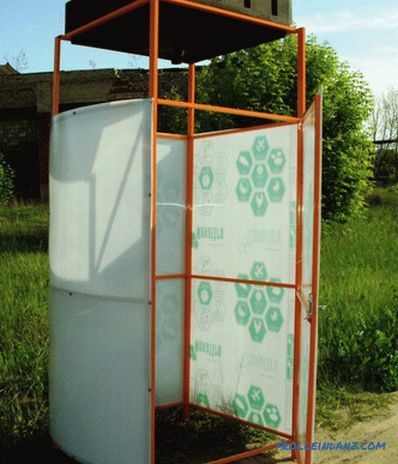 However, such a safe can be installed only in a house with walls of brick or aerated concrete blocks. However, a metal box can be built in not only into the wall, but also into the floor, but only if the room is located on the first floor of the building. 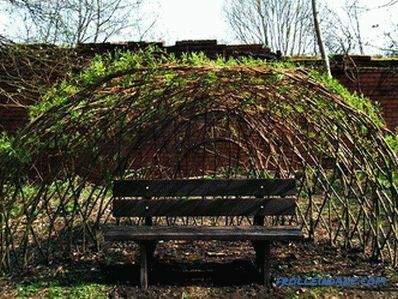 In either case, a niche needs to be made (or, at least, very desirable) at the construction stage. 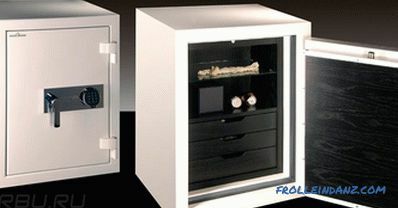 Free-standing safes - the classic home repositories for documents, money, jewelry and other valuables. The vast majority of home safes fall into this category. Such boxes are purchased in cases where it is impossible to build a safe in the wall for some reason. To increase the reliability of the storage, it should be attached to the wall, having pre-assembled a powerful metal frame, or to a reinforced concrete platform on the floor. As well as in the case of built-in safes, you need to do everything possible so that the detached structure does not catch the eye when entering the room. 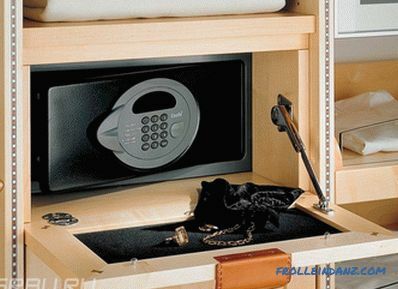 Furniture safes are relatively light constructions placed inside cabinets or pedestals. It is difficult to call them reliable repositories. First, it is impossible to install a thick-walled inside the furniture, which means that a fairly heavy safe is impossible in principle, which means that they all have a low class of burglary resistance. Secondly, an attacker will find such a cache instantly, since thieves in most cases begin to search for valuables from cabinets, bollards and chest of drawers. 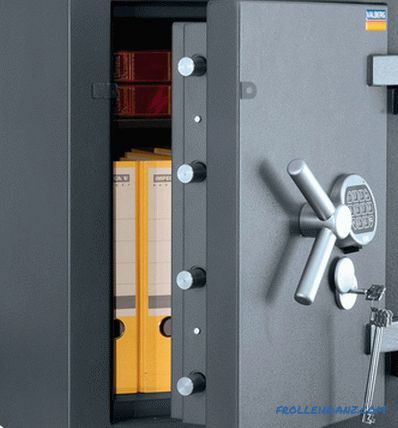 Portable safes are essentially diplomats with reinforced metal walls and locks. They are used to transport documents and relatively small amounts of money. 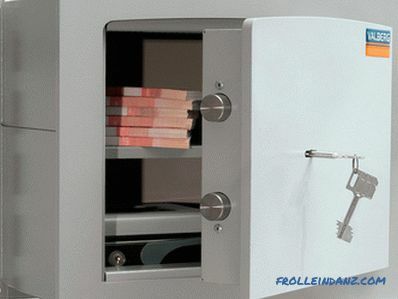 Of course, safes with such a small weight cannot have good protective properties - it will not be difficult for a criminal to steal such a cashbox entirely. To improve the reliability of such products are often equipped with additional radio beacons. One of the varieties of portable safes - boxing. 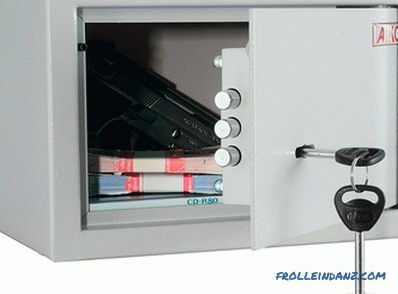 The size of the safe can vary over a fairly wide range, but for home use it will be quite a compact model. In order not to be mistaken with the dimensions of the product being purchased, it is necessary to determine in advance the quantity and type of property saved. For example, if only money is supposed to be stored in a safe, then its internal dimensions can be only slightly more than a couple or three packs of banknotes, while the document repository must obviously contain A4 paper. But even if the sizes of valuables to be stored are more than modest, you should not buy an excessively small safe, otherwise it will be inconvenient for them to use. Experts recommend instead of one large safe buy a few smaller size. The attacker, finding one of the safes, is unlikely to continue the search.But even if he manages to calculate the location of all the vaults, opening several locks is a time-consuming exercise, and this is not in the interests of the thief. 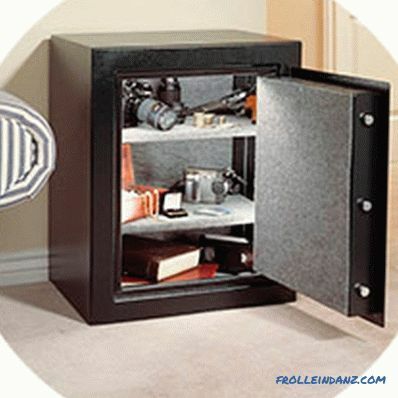 In most cases, safes are equipped with shelves, compartments and cells for convenient placement of things stored there. The organization of the internal space of the safe depends primarily on its internal dimensions. Owners of the smallest models have to be content with one department.